My father loved a road trip, even with a crabby wife riding shotgun and two crabby daughters endlessly bickering and batting at each other in the back seat. 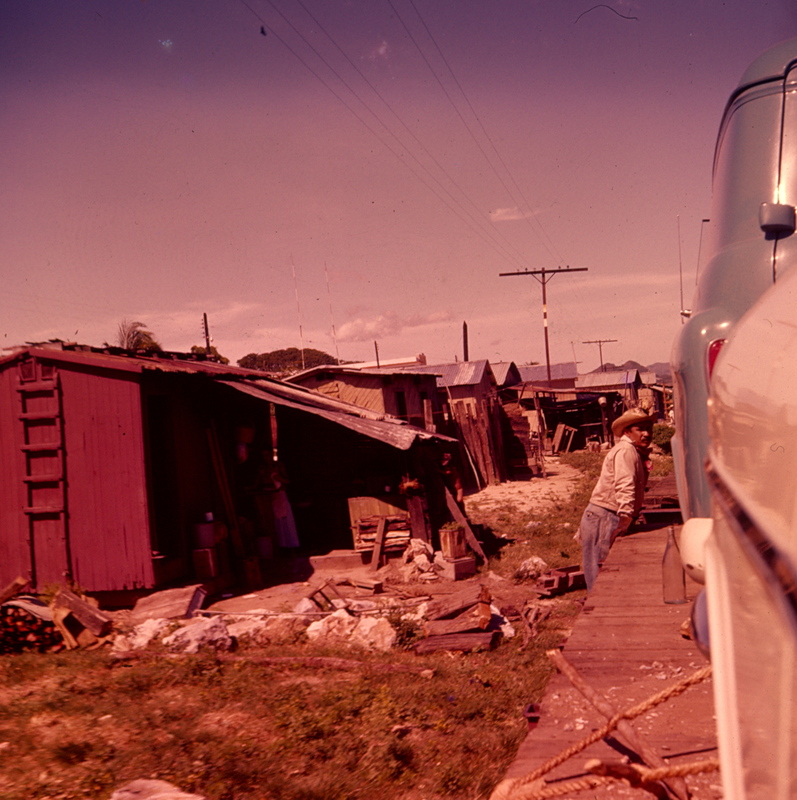 In 1959, Dad piled us all into the car to drive the 2,700 or so miles north from Guatemala City to Los Angeles to spend two months visiting our relatives and eating American food. Before we actually made it out of Guatemala, we encountered construction of a new highway, and during one long endless narrow winding stretch of rocky road, we were repeatedly whistled at and waved to a halt by men wearing straw hats and bandanas, ordering us to wait for the blasting crew to detonate the dynamite that was blowing holes in the mountainside. Through the new openings barely the width of the car’s wheelbase, the tires of our ‘57 Chevy crunched along the cliff edge by the skin of their white-walled teeth, and over and over and over again I slid across the back seat towards my older sister, crossing the invisible center line she had drawn to mark her territory, risking her wrath to avoid looking out my own window into the terrifying abyss beyond it. About a half a day later, we made it into Mexico. As Mom pried Dad’s fingers from the steering wheel, we discovered that all the cars making the next leg of the northbound journey were being lassoed and herded onto the rickety wooden flat cars of an antique train. Damp and dizzy after the death-defying drive, we didn’t realize until the first lurch of the old train as it began its chugging trip north, that we were loaded on backwards. We meandered along for a while, rendered dopey by the clattering rocking of the train and the suffocating heat, but soon enough we were roused from our sweaty stupor as mirages of toilets began appearing in the receding landscape shimmering through the dusty front windshield. The only male in the car, my father could presumably open the car door and discreetly pretend to get some fresh air, and whether he did or not I don’t know, but the rest of us started to squirm. My mother never traveled away from home without an emergency cooler of rations, including bottles of boiled drinking water, ginger ale, cans of Spam, wet washcloths, rubbing alcohol and other useful things. I was 8 and cross-eyed with jittery impatience. Mom finally capitulated to the relentless whining, hacked open a precious can of her favorite asparagus, tossed the contents out the window and leaned over into the back seat of the steaming car to help me make use of the empty can, which I then promptly kicked over. That is hysterical!!! Perfect comedic timing too! What? Your parent did not book with travelocity? This reminds me of a scary episode of “Top Gear” which had me both full of angst and then hysterical laughter. Hi! I’m barbara’s Friend Marya. I love reading your stories. and this one is incredible. That picture is so interesting!